A Master of Arts in Teaching is an advanced education degree that focuses on a specific area in the education field. Students commonly learn the foundations and methods of education and they gain practical experience in school systems. The degree provides individuals with the instructional abilities needed to pursue teaching potions. Students commonly spend a semester working as a student teacher to complete their program. The program generally requires at least 30 semester hours past a bachelor’s degree. Examples of coursework include: development of school aged individuals, education of exceptional students, methods for teaching elementary education, and methods for teaching secondary education. This degree is intended for individuals looking to gain their initial licensure to teach at various grade levels. The Masters of Arts in Teaching degree programs feature a curriculum that meets the educational standards established by the state of residence. Graduates of this degree are typically able to pursue teaching positions in grades K through 12th, as well as certain specialized areas like English as a second language or Spanish. The Duke University MAT program provides students with rigorous study of a specific academic area while preparing them to work as high school teachers. Students who are majoring in English, social studies, mathematics, and the sciences are eligible for the program. The program includes graduate level coursework in teaching, education courses, and a two-semester internship under the supervision of mentor teachers in area high schools. The MAT program at Duke University offers secondary certification in English, biology, general science, social studies, mathematics, and mathematics/physics. The program requires 36 credits and typically takes 11 months of full-time study to complete. Examples of required Duke University MAT courses include educating adolescents, teaching diverse learners, and effective teaching strategies. The Duke University MAT program places more emphasis on advanced study in the teaching field and supervised teaching experience, rather than a strong focus on the study of education. 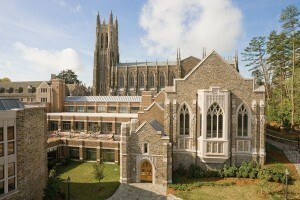 The admissions requirements for the Duke University MAT program include: undergraduate degree in the intended teaching area or closely related field, undergraduate GPA of 3.0 or above, acceptable score on the Graduate Record Examination (GRE), and letters of recommendation that describe the applicant’s ability to complete graduate level education and capability of working as a secondary school teacher. The tuition rate for the Duke University MAT program is $46,215. Financial aid is available for students who show financial need through a general grant or scholarships. The Duke University MAT program administers endowed scholarships, such as the Kegley-Pfeiffer Prize, Graduate Education Scholarship, and the Sulzberger Award. Students can also apply for a special award through the Noyce Fellowship and Durham Teaching Fellowship that provides scholarship and stipends in exchange for the student to teach for at least two years in a high-need public high school. The MAT program also helps students receive financial support from other sources. Additionally, to help pay for the cost of living during the internship period, students receive a stipend on a monthly basis while working in the public school district. The Duke University MAT degree program is a great choice for individuals seeking to work as high school teachers.